Already own a home in the Bay Forest Estates subdivision? Thinking of selling? Click here and read about current search trends & our web network. Bay Forest Estates subdivision is located in Foley, AL and close to a variety of local attractions. 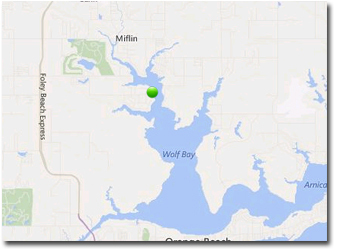 Bay Forest Estates homes is on Wolf Bay and a short run to Pirate's Cove by boat, as well as, about 30 minutes to Perdido Pass and the entrance to the Gulf of Mexico through Orange Beach, AL. The Bay Forest Estates subdivision is right off of highway 98 which runs directly in to Pensacola, FL and also less than an hour from Mobile, AL. Both of these cities have regional airports making air travel easy and accessible. Bay Forest Estates in its proximity to the aforementioned cities is close to a wide range of great restaurants, entertainment venues and shopping outlets. Foley, AL sits in one of Alabama's great outdoor activity centers too with exceptional hunting, fishing and golf courses. Bay Forest Estates subdivision is 30 minutes or less from 10 or more wonderful golf courses with one right in town in Glenlakes. All of these amenities make Bay Forest Estates a great place to start or raise a family with school systems sought after. Please let us know if you would like further info on Bay Forest Estates or any other homes or real estate in the Foley area or would like to schedule a private viewing for any of the homes for sale in Foley, AL by emailing info@condoinvestment.com or by calling (251) Area-Pro (251-273-2776) for immediate assistance. Bay Forest Estates is a great waterfront community and is about 25 minutes from the beautiful beaches of the Gulf Coast. Orange Beach is a well-known vacation destination for families and has a growing condo market. We provide detailed information for all Orange Beach condos including annual rental revenue and prices of recently sold condos as well as closed dates. Use our site view high definition aerial imagery of condominiums and real estate along the Gulf Coast region. We make it easy for users to find specific condos by using our pre-defined searches narrowing listings by price range, waterfront type, boat access, or number of bedrooms. Not only do we provide this information for Orange Beach but we also share useful info for Gulf Shores condos and Perdido Key, FL condos for sale. Our interactive map can help you easily locate available real estate in specific areas such as condos directly on the beach and along popular waterways like Old River, Terry Cove, and Perdido Bay.